In 2014 I was commissioned by EACH to make a piece of work for their foyer in Milton. Working at the hospice was truly inspirational. The building and indeed the staff are very warm and welcoming, with spaces for kids that make often very difficult circumstances really special. Staff told me that the work they do at the Hospice, aims to create memories for families and the children. They offer trips out, creative workshops and creative writing as well as an amazing play area, fully fitted with a life size spider man and pirate ship! The piece I wrote to accompany the work is below and the staff were really pleased with the outcome. In 2014 Local Artist Emily Campbell was commissioned to make an artwork for the large wall in the Foyer of Milton Hospice. Coming to a Hospice for the first time can be an anxious and uncertain time for both parents and their Children. Staff at Milton Hospice told me that often people find it difficult to get through the door and that they try to make the Hospice as non-clinical as possible. The foyer is obviously a really important space, not only is it where people form their first impressions, it is also where families have to wait for Hydrotherapy. Staff at Milton Hospice requested an artwork for the large curved wall in the foyer. The artwork would aim to create an uplifting environment for families and also used as a way of enticing families to the Hospice. The artwork would also help to alleviate stress, distract children from anxiety and also used by staff to help build a relationship with the child. Children and their families often enjoy seeing images of the local area and it was suggested we use the nearby Milton Country Park as a source of inspiration for the artwork. Images of places that children recognise also create a more familiar environment. Integral to Emily’s art Practice is engaging with the community that will be living with the imagery. This ensures that the artwork is both relevant and unique to its site. A period of consultation was held with staff, which was followed by a workshop for children and their families. Staff felt it was really important that the Art Therapists for story telling and creative writing could use the artwork. The use of bubbles was discussed with staff enjoying the fact that imagery was contained. 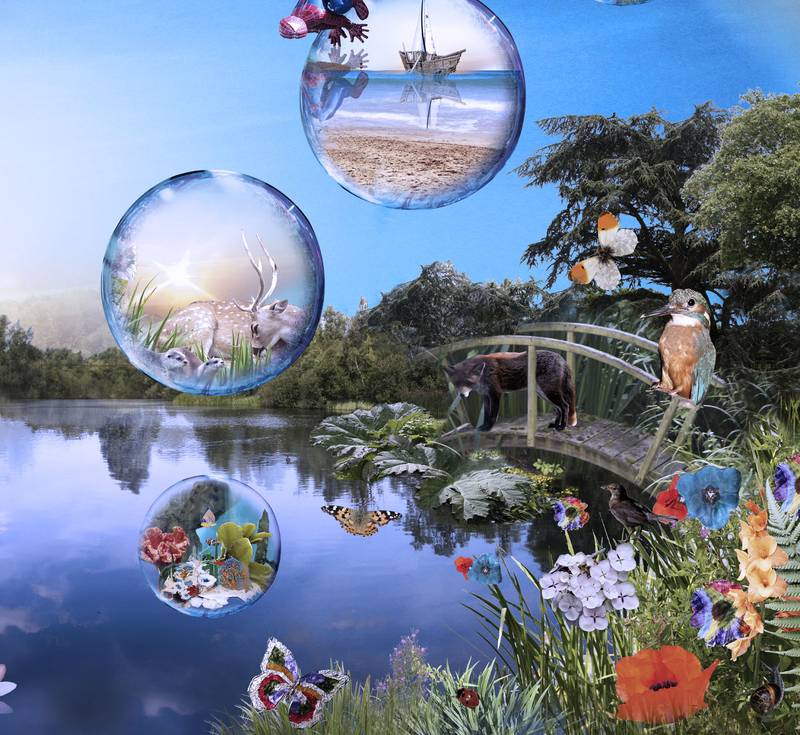 The use of bubbles also meant that multiple images could be produced in one artwork. During the workshop, Emily spoke and showed images of previous projects. Participants were then asked to describe a favourite place or image, for example ‘Red poppies in a green field “ These images have been incorporated into the bubbles. Participants then created collages of fish, flowers etc which were photographed and can also be found with the real photographs in the image. Some Participants also made their own bubbles on the computer. How many things can you spot that are located in and around the Hospice? What do you think the fox is doing? What names would you give the small furry animals?